Rebuilt Truck Transmission | Remanufactured Truck Transmissions Delivered. Rebuilt Truck and Heavy Equipment Transmissions from: Fuller, Rockwell, Eaton, Spicer, Mack, Roadranger, Meritor, Allison, ZF and more. Parts, service and repair for any truck transmission ever built. Our inventory of Rebuilt Truck Transmissions is one of the largest in the World. Ranging from 4, 5, 6, 7, 8, 9, 10, 12, 13, 15, 18 and 20 speeds with same day Worldwide International shipping. We stock thousands of transmissions. Can you really afford to trust something so integral to the operation of your truck or heavy equipment to a roadside shop or truck stop mechanic. All of our rebuilt truck transmissions are professionally rebuilt with genuine OEM parts for the finest quality and reliability available on the market today by certified, factory trained rebuilders. High quality parts and professional installation equate to reliability and longer life meaning more money in your pocket. The Worlds largest rebuilt truck transmission supplier offers same day shipping anywhere in the World at discount prices. Our professional rebuilding services for your existing truck transmission and our rebuilt truck transmission exchange program are second to none in the industry. We back it up with a one year unlimited mileage warrantee and a name trusted throughout the industry. We can pick up and deliver truck transmissions worldwide and also buy rebuildable truck transmission cores. When it comes to the truck transmission that you depend on to make your living or one in your fleet, our rebuilders truly are the pros and we'll prove it. You want it done and done right the first time. Professionally rebuilt truck transmission exchange are an excellent alternative to rebuilding your unit yourself or paying a roadside shop or truck stop to do it for you. We use only genuine OEM replacement parts in all our units and have factory trained, qualified professional rebuilders on staff who know how to do it right. This guarantees the highest quality rebuilt truck transmissions available on the market today, built to the correct specifications and tolerances provided by your existing data tag. Our rebuilt transmission exchange program works as follows: We deliver your rebuilt, factory reman or new truck transmission from one of our rebuild centers located throughout the USA to your shop or service center and when your ready, we send a truck back to pick up the core. We even pay for the return shipping. We work with shops all over the World and can deal directly with the service manager on your behalf to get the job done fast. You can also purchase any rebuilt truck transmission outright, (without a core) and have it delivered, however a core charge may still apply on certain units. Factory remanufactured transmissions are subject to the factory exchange procedures. Simply put, a rebuildable core must be returned. Rebuilt truck transmissions, parts and exchange from the leader in the industry: Rebuilt truck transmission, rebuilt tractor trailer transmission, rebuilt heavy equipment transmission, rebuilt semi truck transmission and parts delivered anywhere on the planet. All of our rebuilt truck transmission models are available for delivery or shipping Worldwide. Locating the remanufactured truck transmission that meets your needs for dependability and cost effectiveness can be difficult if you don't know who to trust, or who builds a high quality rebuilt truck transmission and stands behind their work. At World Drivetrain Supply, we offer the finest remanufactured truck transmissions on the market today. Rebuilt truck transmissions built with OEM replacement parts that not only meet your needs but also gives you the advantage of huge savings over our competition and a one year unlimited mileage warrantee that we stand behind. Our inventory of remanufactured truck transmissions means we will have the correct rebuilt truck transmission, in stock, built to the data tag specifications you need for the right transmission for your truck, whatever type of truck you're driving and whatever brad of transmission might be in it. We offer a lot of choices when it comes to setting up your rebuilt truck transmission for you, like the latest updates from the manufacturer and the newest parts available for your model along with upgrades and modifications such as overdrive, transmission coolers, additional lubrication systems and more. 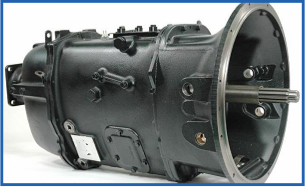 You will receive a high-quality remanufactured truck transmission that you simply cannot get anywhere else. Rebuilt truck transmission and all related repair and replacement parts for heavy duty trucks and equipment. Rebuilt, and good used truck transmission and factory remanufactured truck transmissions. Our remanufactured truck transmissions are easy to install and delivered to your door. The World Leader in Truck Drivetrain Components and Parts. Truck Transmissions, Differentials, PTOs, Transfer Cases and Parts.